Dean Mitchell's realist approach to portraits and landscapes captures the subject matter with flawless, unadulterated, refined power. The May 2010 issue of Western Art Collector (volume 33) included an article titled Fluid Transitions where I shared my appreciation for the complex, uncompromising medium of watercolor. Noted American wildlife painter John James Audubon (1785-1851) completed his first wildlife study in 1805 in watercolor and devoted himself to recording this aspect of the North American continent in a manner seldom equaled in any other medium. Skilled and talented artists like Thomas Eakins (1844-1916), Winslow Homer (1836-1910), and James A.M. Whistler (1834-1903) established watercolor as an American art form, challenging the European masters. This American school developed with an abundance of important artists, including John Singer Sargent (1856-1925), John Marin (1870-1953), and Maurice Prendergast (1858-1924), who were succeeded by Andrew Wyeth, Edward Hopper and the late master Donald Teague. Each of these great artists represented a unique individual approach to the medium of watercolor. This entire group represented "individualism" as a key factor in the development of this medium. Within each issue I am provided the opportunity to share my personal perspective of an artist whom I respect and call my friend, interject their struggles, accomplishmehts, and identify what I believe describes their work. Continuing to share my passion for this captivating medium, I have chosen to introduce you to the artist whom I consider to be America's foremost living watercolorist, Dean Mitchell. There are other contemporaries who certainly deserve recognition: Thomas William Jones, Tom Hill, Steve Hanks, Thomas Quinn, Joseph Bohler, and John Fawcett - to mention a few. I first met Dean Mitchell in 1990 in Ruidoso, New Mexico, at an art show produced by R.D. Hubbard. Dean, although in his early 30s, appeared 10 years younger. I found him reserved; he spoke with a soft voice, seemed overwhelmed by the elegant well-attended formal event that featured a select group of America's greatest artists, including notables such as Richard Schmid and Howard Terpning. Amid what I considered as one of the strongest, diverse exhibitions of contemporary art I had attended was a portrait of an elegant elderly black woman titled Rowena, which absolutely stopped everyone in their tracks. The artist was this soft-spoken young man, Dean Mitchell. Dean Mitchell, Rowena, oil, 29-1/2"x39-1/4"
The artist says ... "She was already very old when I met her, but she was full of life and energy. I remember watching the tiny steps she took when she walked, but I had never seen a little old lady move as fast! I knew that I had to paint her. She was one of those rare people that you just want to share with the world." I will never forget this painting; it captured your soul. She was dressed in her Sunday best, I would assume attending a church service, her wide-brimmed hat created an interesting interaction of light and shadow, her withered hands beautifully painted were held up to her mouth in reverence, giving thanks for her blessings, her facial expression told so many stories of struggles and hardships, yet there was this presence of self-dignity and pride that brought forth emotions that profoundly moved you. Although painted in oil, I was compelled to include the painting, Rowena, in this article to demonstrate the expressive depth, masterful detail and dedication of this young man to his art.After the show I had the opportunity to visit at length with Dean at a private reception a a friend's home. Although still quite reserved, as our conversation developed, it became apparent he was well educated, enthusiastic about his profession and believed his art had a purpose—an expression of self, the people and places he knew; their hardships, struggles, pride and love of God. 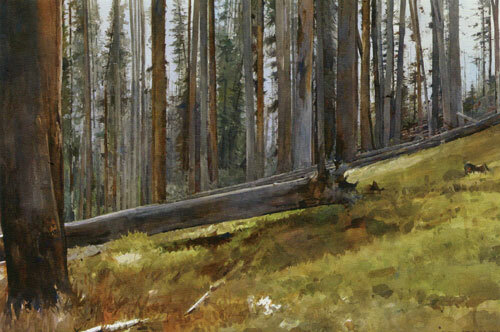 Dean Mitchell, Yellowstone Forest, watercolor, 20"x30"
Available at the 2011 Prix de West Invitational Art Exhibition. This was a young man dedicated to a purpose; I was convinced he would become one of America's great artists, that history would treat him well. Dean Mitchell was born near Pittsburg, Pennsylvania, in 1957, and within one year his family moved to the small town of Quincy in Florida. His mother Hazel attended Florida A&M University. Dean was raised by his maternal grandmother, Marie Mitchell, and along with Dean's mother they shared a small house with his uncle Ben and cousin Carolyn, who became like an older sister to Dean. While growing up, Dean did not meet his father, but he tells the story of when his father would visit his paternal grandparents only one block from their home and he would sneak over and watch for him from behind some bushes but would never approach. He is convinced this had a psychological or subconscious emotional effect on him during his early years. Through his grandmother Dean learned to have self-confidence. Although she worked at minimal jobs to support the family, she had great dignity and instilled in him the self-assurance to dream of a future and determination to become the best you could be. 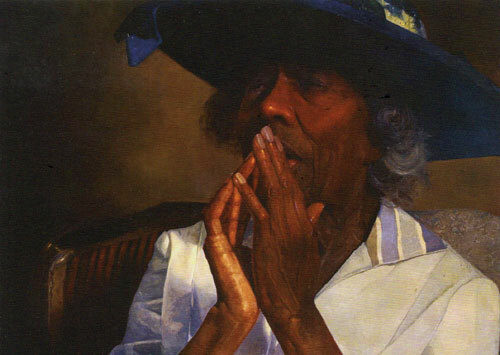 Dean Mitchell, Grandmother, acrylic, 9"x14"
The artist says ... "My grandmother's love, dignity and respect for others have shaped my life. Her moral and spiritual influence gave ma sense of self-worth, pride and inner strength to pursue my dreams. In this small frail body was a deep commitment to the well-being of family. She always gave unconditionally, reinforcing love above all else. She was such an important part of my life that even today it is difficult to talk about her without the stingof tears in my eyes." At the age of 5, Dean was given a paint-by-numbers set; after completing the first picture, following the directions precisely, he painted the next ones the way he wanted, choosing his own colors, and then began drawing his own pictures. When Dean was 12 the family moved to Philadelphia. During the following three years he became seriously interested in art, encouraged by his grandmother to continue his artistic pursuits. Dean found jobs to raise money to buy his first set of oil paints. Inspired by the work of Norman Rockwell's cover art of the Saturday Evening Post magazine, he began emulating the work of this master artist. Before entering ninth grade, ftts family moved back to Quincy. Many family members and friends, although recognizing his exceptional talent and dedication to his art, discouraged his artistic pursuits; they were convinced there was little if any future in becoming an artist. It was his grandmother's belief in him and [that of] his junior high school teacher, Tom Harris, who convinced him to continue. Dean states, "Mr. Harris told me I had a 'keen eye for composition, and a unique abstract perception of seeing things. This was a natural talent which can't be taught and should not be casually discarded.'" Mr. Harris encouraged Dean to enter art shows and took him to art fairs where he could compete for prizes. In the North Florida Art Fair, he first competition he entered, Dean received two awards of merit, which encouraged him. Dean Mitchell, Misty, watercolor, 20"x30"
With any employment he could obtain, his competition prize money, sales of paintings, scholarships and grants, in 1975, Dean enrolled at the Columbus College of Art & Design in Columbus, Ohio. Considering his options in art as a profession, he majored in commercial art rather than fine art. Competing with students with previous professional training, Dean found it difficult to maintain the curriculum and found it necessary to work considerably more hours to attain the accepted competence required by his professors, yet he still managed to find time to work on his first love of fine art. During his sophomore year his artwork began to win numerous awards. One such award presented at the Panama City Art Fair not only came with a $100 savings bond, it provided an opportunity to hold a one-man art show at the popular Bar and Safari Lounge in Panama City and acceptance into one of the established art galleries, the Bay Art & Frame Gallery, which began selling Dean's paintings on a regular basis. In Dean's senior year at Columbus, he entered his first submission to the prestigious American Watercolor Society show and was accepted. After graduating from Columbus College in 1980 with a bachelor's degree in art, Dean moved to Kansas City, Kansas, where he supported himself illustrating and painting pictures for Hallmark greeting cards where he remained in their employ until the end of 1983. 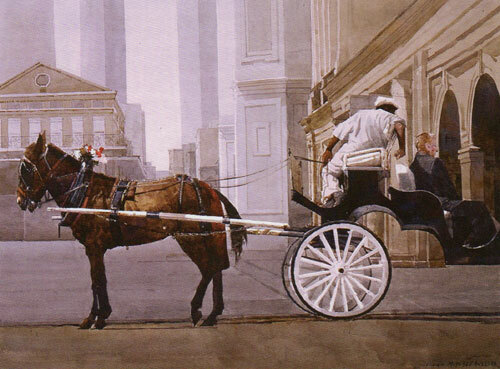 Dean Mitchell, Carriage Ride, watercolor, 15"x20"
The artist says ..."I came away from the French Quarter of New Orleans with a deep respect for the carriage drivers as I overheard them speaking to the people on the carriage tour. They were lecturing about the history of the places and scenes for the onlookers on the ride. It was a truly beautiful moment as the driver turned to share the history of this great America city." During his employment in 1980, at age 23, he had been accepted into the National Watercolor Society, he was winning numerous awards, his fine art was selling, but he had found little personal reward or interest in the commercial field. It became obvious this was the time in his life to make a choice of which career he would follow. In 1984 he suffered a major setback when his grandmother passed away. This was an inauspicious time in his life - something he had difficulty dealing with - his focus and direction was gone, he found himself in a state of depression, a mood of hopelessness. He found solace in prayer, and knew in his heart her wish would be for him to continue his dream to be the best he could be. Dean began to explore the theme that would direct his art: He dedicated himself to the portrayal of the people who he had grown up with, to record these God-fearing people, their dignity, nobility, moral fiber and soul. In 1985, at age 28, Dean was recognized as an American Watercolor Society member, he was back on track—he compiled the last of his savings to enter the T.H. Saunders International Artist and Watercolour Show in London, England, where he was awarded best in show, a significant moment in his career. When making the decision to initiate the formation of the Masters of the American West in 1998, I invited Dean Mitchell to participate. In 1999 he became part of the Autry's Masters family and each year has provided masterful works introducing our patrons to the medium of watercolor and the convergence of his subject matter into the mainstream of American history. Dean Mitchell has been an important factor in the phenomenal success of this diverse, nationally recognized fine art exhibition and sale. Certainly one of the most significant moments in the life of Dean Mitchell began on December 7, 2004, while presenting a lecture at the Scottsdale Artists' School where he met an attractive young lady, Connie Chavarria. She became his No. 1 priority and his inspiration; Dean dedicated his life to her. After courting Connie at every possible opportunity, she accepted his proposal and they were married in Ogden, Utah, on June 24, 2006. On November 12, 2009, they were blessed with twins, Ava and Noah, a girl and boy now nearly 2 years old. Dean's mother, after graduating from Florida A&M with both her bachelor's and master's in education, retired from the Veterans Administration in East Orange, New Jersey, and now resides within one hour of Dean, Connie and her precious grandchildren in Tampa, Florida. Recently, Dean had the opportunity to meet his father, a prominent business leader, and they are building a successful relationship. One might assume Dean's grandmother is still looking over him. I am certain she has considerable influence where she is now. 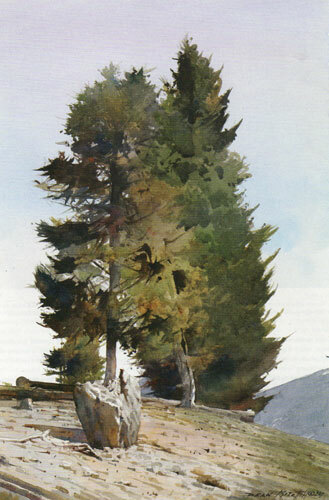 Dean Mitchell, Colorado Pines, watercolor, 15"x10"
The artist says ... "These pines stand majestic upon the great Colorado Rockies." Dean Mitchell's realist approach to his portraits and landscapes capture his subject matter with flawless, unadulterated, refined power. Dean works in several mediums - oils, acrylics, pastels and watercolor; he works intuitively, choosing his palette, brushstrokes, design and composition in the moment. His paintings are from deep within himself, from his personal relationship and inspiration of the subject. The weathered buildings, old homes and churches are objects of inspiration, although obviously drawn to the humane and spiritual, his work is pure; it comes from what I would refer to as his soul—this is the passion that keeps a work of art alive throughout time. Although Dean Mitchell has mastered each of the mediums he works with, it is the captivating purity and translucent luminescent qualities of watercolor that stimulates him; the purposeful brushstrokes, the layers of paint creating unending sensitive values of color, the illusion of the interaction of light and shadow, his meticulous control of edges - each of these components respond to his technique and skillful application of this elusive medium. As past master Donald Teague once stated, "Who among the watercolorist would deny that the medium is the most completely captivating of all, to me it is as beguiling as a beautiful woman, so female in its capabilities for change and stimulation, so voluptuous when it smiles on you. At times you feel as though you have been seduced." 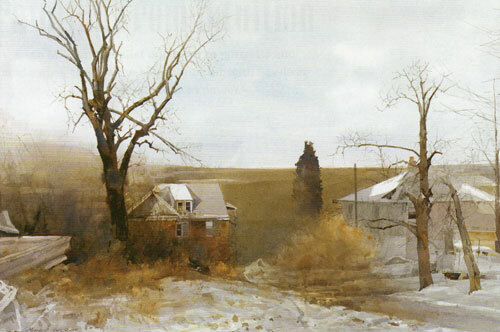 As a member of the American Watercolor Society, the National Watercolor Society, and Allied Artists of America, Dean has received numerous awards of recognition including the American Watercolor Society Gold Medal and Edgar A. Whitney Award, the Thomas Moran Award from the Salmagundi Club in New York, the Lena Newcastle Award from the American Watercolor Society, the Remington Award for Best Painting from the American Artists Professional League, the nationally recognized Arts for the Parks competition in Jackson, Wyoming, multiple best of show awards from the Mississippi Watercolor Society Grand National Exhibition and, most recently, the gold medal for watercolor for the second time at the 2011 Masters of the American West Fine Art Exhibition and Sale held at the Autry National Center in Los Angeles. Artist Dean Mitchell in his Florida studio. 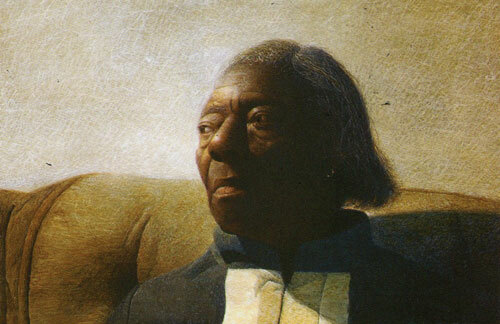 consider the paintings of Dean Mitchell a significant component of their collection. Dean Mitchell is represented by Astoria Fine Art, Jackson, WY; Hearne Fine Art, Little Rock, AR; Morris & Whiteside Galleries, Hilton Head Island, SC; and J. Willott Gallery, Palm Desert, CA. John Geraghty, Trustee and Special Advisor to the Autry National Center's Masters of the American West Fine Art Exhibition and Sale, shares his insights on the Western art scene. Both he and wife Saralynn are afflicted with the incurable passion of collecting Western art.